Outdoorsolarstore.com is owned and operated by Summit Ecommerce Group LLC, a fully licensed business headquartered in beautiful Golden Colorado. Clean energy and high quality, easy to install lighting products are their passion. Even though it’s not Christmas time yet, it’s never too early to plan how you’re going to decorate your yard. Outdoor Solar Store carries amazing Solar Powered Christmas Lights. I received the Solar Powered LED String Lights to review. It has five multicolored assortment – red, green, yellow, blue and white. 100 lights will dazzle your bushes and trees as you welcome Santa! You can set the lights to solid or blinking. The strand of lights measures 39 feet. It has a high quality solar cell panel. The battery is rechargeable, and it has automatic nighttime operation. Illumination time is set to up to 8 hours! Wow! No outlet is required with these multi-colored lights! Setup is a BREEZE! These lights can be used for holidays, parties, garden accents and walkways! The price is also very reasonable. Just $28 to add some sparkle for your holiday season! The attic fans are sure to cool down extremely hot attics! As soon as I walk into my attic, I am overwhelmed by the thick heat that is there. These solar attic fans by U.S. Sunlight offer the best performance of any attic fans on the market. Enjoy a 20% – 30% reduction in your cooling bills with these easy to install attic fans. Their all purpose ventilator is perfect for tiled roofs or to boost your current static vents. 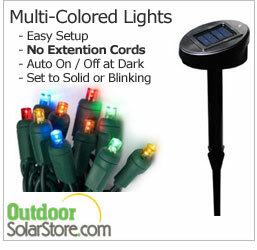 Outdoor Solar Store also sells Solar Lamp Post Lights! This Windsor Solar Lamp Post Planter is beautiful! I’d love to adorn my back yard with this exquisite lamp post. The Windsor Solar Lamp Post Planter is an excellent way to have a solar lamp post in your garden, without making the commitment of bolting it to one place. This solar lamp has a planter on the bottom to help beautify your yard while capturing the sun’s energy to give off light at night. This 7 foot tall lamp is made with weather proof cast aluminum which is maintenance free. You can purchase all of the above by visiting Outdoor Solar Store’s website. One lucky winner is going to receive the same Solar Powered LED String Lights that I received! Visit Outdoor Solar Store, and let me know something you learned or another product you’d love to own! (+1) – “Like” Outdoor Solar Store on Facebook. (+1) – Follow Outdoor Solar Store on Twitter. Disclaimer: I received the Solar Powered LED String Lights from Outdoor Solar Store free of charge in exchange for an honest review. No other compensation was received. However, all opinions are strictly my own. I would like to get the Moderna Solar Lights – 4 Light Set. I like the Moderna Solar Lights. I would LOVE LOVE LOVE to have a solar attic fan!!! I follow the Outdoor Solar Store on Twitter. Found this giveaway on contest girls site. I like the Liberty Light – Solar Flag Light, so I wouldn't need to take my flag down at dusk. I would love the Solar Patio Lights. Follow them on facebook as Sarah C.
I liked OutdoorSolarStore.com on Facebook (Deborah Rosen). I followed odoorsolarstore on Twitter @AsTheNight. I liked Beautifully BellaFaith on Facebook (Deborah Rosen). I followed ittleamberfate on Twitter @AsTheNight. I follow with Networked Blogs (Deborah Rosen). I shared on twitter: http://twitter.com/#!/AsTheNight/status/90942468614393856. I found this giveaway at Online Sweepstakes. I also like the Solio Classic USB phone charger. I follow via GFC as EBJ. I like the Windsor Solar Lamp Post. I like the Solar Lamp Cap Light – Triple Pole Mount. I learned that it gives you a $70 a year savings for a comparitve light fixture. I (mattnneb) follow Outdoor Solar Store on Twitter. I like Beautifully BellaFaith on FB. I (Thomas R Gerber) follow Beautifully Bella Faith via GFC. I would like the Watchdog Solar Security Light-perfect for my dark yard. I follow Outdoor Solar Store on twitter as ptowngirl. i love the fact that it seems to be such an easy setup! Follower via GFC, and I would like to have one of the Solar Attic Fans. I'd love to own the Solar Lamp Cap Light – Triple Pole Mount. Following Beautifully BellaFaith on Twitter @hle123. I think the Solar Christmas Wreath would be a wonderful addition to our decoration. I follow/like Outdoor Solar Store on Twitter- danellejohns. The solar Christmas wreath is pretty cool! I follow you and FB like. I also like the Baytown Solar Lamp Post Planter. and I follow on GFC! I would love to own the solar attic fans – 12″ fan ventilates 1150sqft for the house we are planning to build. And learned they are eligible to the 30% tax rebate including price of prudct, any sales tax, and cost of installation. wahoo! I like their Solar Powered Address Signs too. I like the solar flood lights. I like the Liberty Light – Solar Flag Light. Thanks. I would love to own the Professional Grade Solar Attic Fan – I sleep in the attic. You have just voted for Beautifully BellaFaith! I love the Royal Solar Lamp Post. Solar Motion Activated Flood Light. I entered the Wedgie Gardening Tool Giveaway. “Like” Outdoor Solar Store on Facebook. Thanks for the giveaway…we like the “Watchdog Solar Security Light” ! …just voted for Beautifully BellaFaith @ Picket Fence Blogs. I would love to have the Royal Solar Lamp Post. Actually, I would love to be able to replace all my outdoor lighting, and add some, with solar powered options.